This spacious 2 level gallery style boutique and event space is conveniently located in the heart of the Upper West Side. It is perfect for an Art Opening, Pop-Up Store or Fashion Showroom. This space has held numerous pop-up events in the past including parties and live music. All creative ideas are welcome. The space itself is beautifully laid out with track lighting, wood detailing and hardwood flooring on the upper level. There is also metered street parking and a parking garage located next door as well as a basement space available for storage before and during an event. Amenities include free Wi-Fi, Sonos speakers, a large flat screen TV available on the main level to use for displays, advertisements, and presentations as well as assistance with anything particular for your event, which can be provides at an additional charge. This space is located on a busy street with a lot of passing traffic. 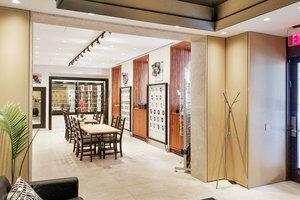 It is a great space to connect with customers through a manicured pop-up event.